In large bowl, beat butter, sugar, vanilla, gelatin and egg with electric mixer on medium speed, or mix with spoon. On low speed, beat in flour. Shape dough into 1 1/4-inch balls. Cover and refrigerate 1 hour. Heat oven to 375°F. On ungreased cookie sheets, place balls about 2 inches apart. With sharp knife, make 6 cuts in top of each ball about three-fourths of the way through to make 6 wedges. 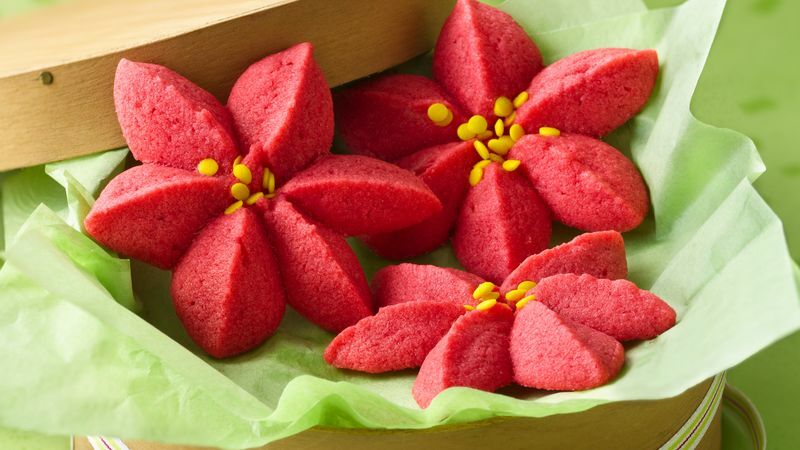 Spread wedges apart slightly to form flower petals (cookies will separate and flatten as they bake). Sprinkle about 1/8 teaspoon yellow candy sprinkles into center of each cookie. Bake 9 to 11 minutes or until set and edges begin to brown. Cool 2 to 3 minutes. Remove from cookie sheets to cooling rack. Cool completely, about 15 minutes.